Made very recently by Retrogamingcables in the UK. All cables are tested before dispatch. Made in Great Britain. This is not an official Micomsoft product. These are specially made cables. Works with monitors that accept RGB composite sync via BNC cable. You are using a professional grade RGB monitor. Don't cheap out on your cables! Replace your broken / bad connection cable. - Compatible with Sega Genesis 1 console. Cable Length: approximate 170 cm. Made very recently by Retrogamingcables in the UK. This is not the CVBS, CSYNC (pass through), or Sync-on-Luma (for 1-chip-03 consoles) versions. This cable supplies an RGB video signal and stereo sound from your Super Nintendo which is far superior than the original video cable. The cable is unidirectional. 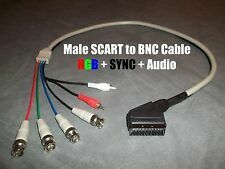 Works with monitors that accept RGB composite sync via BNC cable. Compatible with Nintendo N64 NTSC Version only (US Console). So it Maximizes picture and sound quality. Replace your broken or missing Playstation AV cable. Cable Length: 168cm. Weight: 82g. Made very recently by Retrogamingcables in the UK. - Cable is wired for Luma Sync. This cable supplies an RGB video signal and stereo sound from your Sony Playstation which is far superior than the original video cable. Every cable is designed with industry standard impendence and signal level characteristics for maximal compatibility and performance. Mini-coaxial cable for sync signal to reduce interference and video noise. It is NOT intended for use on PAL Saturn consoles. Cable does NOT have the RCA Audio break out. Made very recently by Retrogamingcables in the UK. This cable is screened to minimize interference. Compatible with SEGA Dreamcast console. - Compatible with PAL monitor/TV output only for RGB signal. - Superior to standard composite cable. IMPORTANT NOTE: Original NES consoles DO NOT support RBG output by default and need to be modded to output an RBG signal! Cable Length: 165cm. Weight: 66g. BUILT IN LM1881N SYNC STRIPPER for XM29, select PVM & BVM models, etc. You are using a professional grade RGB monitor. Don't cheap out on your cables! Compatible with Xbox Gen 1. Cable Length: 165cm. So it Maximizes picture and sound quality. HOW TO CONNECT: Console --> RGB21 cable --> THIS CABLE --> RGB monitor. Female RGB21to 4 BNC Stereo Audio Cable. Works with monitors that accept RGB composite sync via BNC cable. 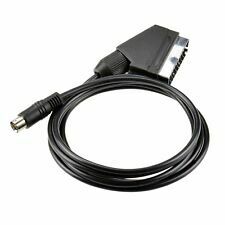 This cable supplies an RGB video signal and stereo sound from your NTSC N64 is far superior than the original video cable. This cable is screened to minimize external interference and cable crosstalk between signals. Works with monitors that accept RGB composite sync via DB25 such as Sony PVM-2030 or 2530. FOR USE WITH NTSC OR PAL CONSOLES. NON CONTINENTAL USA AK / HI / PR / APO / FPO / & OTHER US TERRITORIES. In this cable picture and sound cables are separated Which Give You THE BEST QUALITY FOR BOTH. 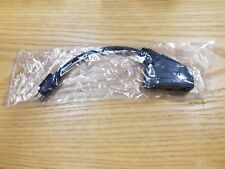 This cable supplies an RGB video signal and stereo sound from your Sony Playstation 1 which is far superior than the original video cable. This cable is screened to minimize external interference and cable crosstalk between signals. There is also 2RCA to JACK adapter if you need JACK plug (not RCA) for sound. BUILT IN LM1881N SYNC STRIPPER for NEC XM29, select PVM & BVM models, etc. You are using a professional grade RGB monitor. Don't cheap out on your cables! For NEO GEO AES, CD, CDZ. if you have PCB revision in your NEO GEO AES console no. NEO-AES3-5 or NEO-AES3-6 you do not have composite sync in AV slot;. Compatible with Sega Genesis 2 only. If you want this cable for Japanese RGB21 TVs, you can add modification service here. Much better screen quality than normal AV cable. USA, Australia, Canada. 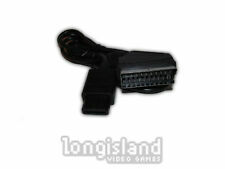 RGB SCART cable (SYNC on Luma) for use PlayStation 1 and 2. Only been used about 3 times in total. The best video quality possible for PlayStation consoles. Manufactured by Insurrection Industries. Photos shown cable being used through Open Source Scan Converter on an HDTV. OSSC does not come with listing. 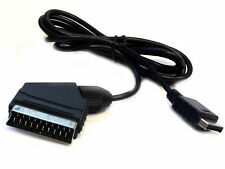 RGB SCART cable being sold only!! 6.70 USD - Rest of the World. 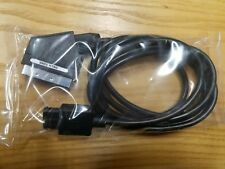 It's a RGB video cable for: Super for Nintendo N64 NGC SNES, PAL Super for Nintendo. Material: PVC (Polyvinyl Chloride). High transmission rate, superior picture quality. Sega Nomad. In this cable picture and sound cables are separated Which Give You THE BEST QUALITY FOR BOTH. 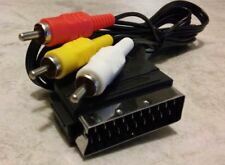 SKU: Z361 Item Description Features: 100% Brand New and High Quality High Quality cable of RGB Scart to Sega Saturn Console Connector. Compatible with Sega Saturn. Made by Third Party . Specification: Cable Length: 1.8cm Material: Bare Copper Wire Color: Black Quantity: 1 PC Net Weight: 84g Note: Lighting, display and other factors may cause COLOR SHADING, please comprehensive pictures and text descriptions to determine! 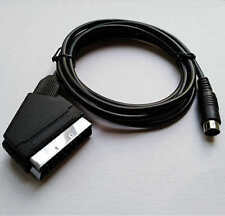 Package Includes: ● 1 x RGB Scart Cable. Compatible with for SEGA Dreamcast. Enabling greater all-round picture clarity than standard AV cable. Improve the visual quality of your console by this cable. Cable length: 1.8m/5.91ft (Approx.). 1 X Adapter Cable. CLEAN SYNC / COMPOSITE SYNC version. 6.70 USD - Rest of the World. The few compatibility products available were expensive and often quite confusing. So we launched Insurrection Industries to make things better. More affordable. Stereo audio integration using a connection to the front headphone jack.